Lemons are really a winter fruit as its seems like the vitamin C of the cold months and even though their taste speaks of summer and sunshine. I have two harvests a year on my small collection of potted trees. My Japanese Yuzu is the only one that can be left outside in the soil as one says that it can survive up to -15° temperatures even though it has never been tested. The Yuzu, the lime and the four season lemons are in flower and will be in fruit in mid-summer. Visually they are beautiful trees and to pick your own citrus when needed throughout the year is a newly discovered luxury. I still have a large box of lemons left over from the autumn which are now a little more thin skinned than they were when fresh but are excellent for juice and cooking. I also have a friend over the border in Navarre who has made citrus fruits a hobby and as she lives alone, always has a crate or two of lemons to give me just when I need them. Apart from starting the day with a fresh lemon juice in warm water, Lemons are essential in my kitchen for lemonade, salad dressing, drizzling over fish, to cut a mayonnaise or aioli and for its zest. Of course, such exotic fruit have never been part of my culture as I seem to remember, the first real lemon fruit to enter our house in Ireland was around my 12th birthday, and I'm sure that is only because one of my sisters had brought one back from abroad (perhaps around the same time as our first artichoke). 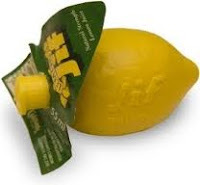 Up to this moment, lemon was a squeezy, lemon shaped plastic JIF bottle tasting of something sharp and acid. Needless to say, the real thing was a revelation. Rince the lemons well in cold water and cut into thin slices. Lay them out individually in a baking tray. In a large saucepan, boil the sugar, cumin, cinnamon and water. Once the sugar is dissolved, pour this mixture over the lemons and cook in an oven at 140° (4-5) for 30 minutes. Leave it to cool before pouring it into a jar and sealing it. Keeps in the fridge for over a month.